The word chakra comes from the Sanskrit meaning "wheel." Think of it like a spinning vortex through which energy moves in and out of your body. We have seven primary chakras, with vortexes that open both out the front and back of the body, except for the crown and root chakras, which have vortexes that open up and down respectively, with an internal vortex pointing back into the body. Also, each chakra shares energy with the chakra above and below it. Each chakra has a thematic function and power associated with it. In this way, each chakra is a center of energetic development and exchange between you and the world. For example, your heart chakra is the energetic center concerned with forming loving, compassionate, and harmonious relationships. It is also the chakra that mediates the unconscious impulses of desire and need rising up from the lower chakras and the higher conceptual information descending from the upper chakras. Having the heart chakra properly energized and balanced can make a critical difference in your ability to create nourishing, satisfying relationships in your life. There is a great deal more to say about chakras beyond what we can address here. 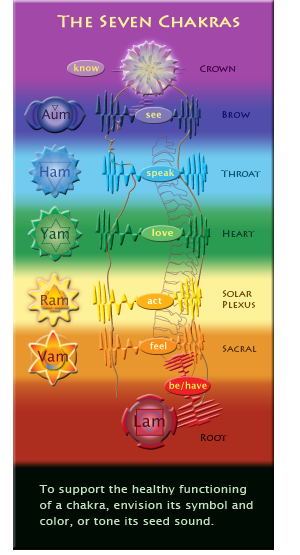 For now, explore the diagram to learn the function of each chakra, its symbol, color, and seed sound. Note: The seed sound for the crown chakra is silence.